5 Bedroom Semi Detached House For Sale in Penzance for Guide Price £600,000. The approach to this property is through a gateway with a drive that winds through a meadow garden arriving to the front entrance and parking area. This former Vicarage dated around 1740 has evolved into a deceptive property which offers the potential to be used as a B&B, a holiday home or a large family home. The spacious entrance reception hall with its grand staircase gives you a sense of what's to come. The ground floor to the older section of this property has a very large bedroom suite with a separate sitting room and bathroom. Across the hall is a superb large reception room with a feature fire place used as a guest breakfast/dining room. From the hall steps lead to a large store room and the entrance to the rear section of the property. Staying in the older property, the first floor provides three bedrooms two of which are very large bright suites with sitting rooms and en-suite bathrooms. The third is a double bedroom with an en-suite and dressing room. To the rear of the property is a large extended ground floor section which includes an open plan spacious kitchen/breakfast room with views over the rear garden. There are a variety of fitted units, range style oven and a central island with inset sink. Moving to the left side of the kitchen is a very large dining and sitting room with a feature stone wall and beamed ceiling. This room also has views over the garden. A further entrance leads to a storage and second side entrance door out to the front of the property. To the right side of the kitchen is a large utility/store room plus a boiler room which has a further side entrance door. One unique feature to this property is the extremely long bedroom suite with a spacious fitted bathroom, open walk through dressing area with a range of fitted wardrobes, which then leads to the ample bedroom area. The room has six sets of patio doors making this room bright plus opening onto the rear garden. The rear garden has a pathway around the edge of the central lawn court yard style area which then expands out to a larger lawn area providing plenty of space, plus a variety of flower and shrub borders. To the front is the pretty entrance driveway dividing the lawn with mature flower and shrubs and a variety of trees, enclosed by a tall stone wall creates a tranquil setting. The turning circle at the front of the property leads to a 3 bay car port, plus further parking area. The property has mains electricity and water. Private drainage. 2 Oil fired boilers for central heating and hot water. Solar panels providing electricity for the whole property. 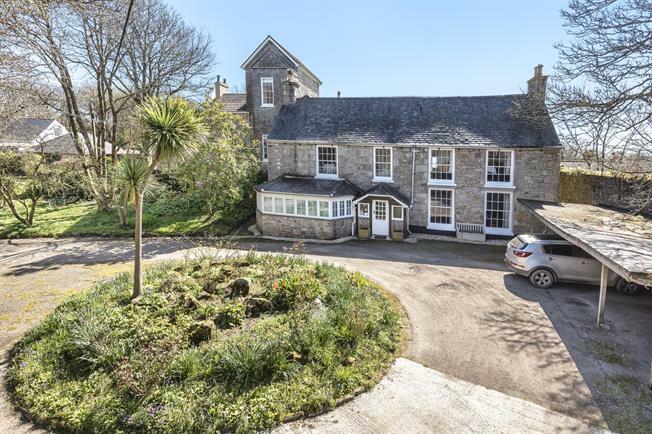 The property is situated in the quiet pretty village of St Hilary a rural area positioned between Hayle on the north coast and Mount's Bay, St Hilary is a small village with a school, a church and a collection of period property. The neighbouring village of Goldsithney provides local pubs and village store. The surrounding countryside is ideal for unchallenging walks, for instance along the nearby St Erith river towards Hayle. There are also superb walks along the South West Coastal path from Penzance to Helston passing a variety of beaches and coves along the way. Penzance provides the larger selection of shops and amenities along with the main line station connecting to Truro and on to London.